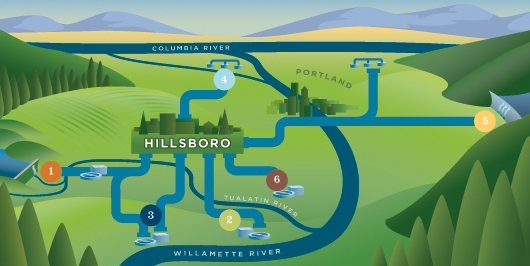 Hillsboro Water is analyzing the six options below for a future water source. These options are considered viable at first glance because they appear to have sufficient supplies of high-quality water available for municipal use. Creeks and other water sources may be located closer, but are unfortunately unable to provide the volume or quality of water needed to serve Hillsboro’s residential, commercial, and industrial customers. The project will further analyze these six options to determine the one(s) that make the most sense to pursue. The largest river wholly within the state’s borders, the Willamette is an abundant resource. In fact, it is one of the few rivers with water available to be withdrawn in the critical summer months in Oregon, while still maintaining habitat for critical salmon and steelhead. Is there enough water in the lower Tualatin for drinking water purposes? The river is recharged at Durham by outflow from Clean Water Services, but there may not be enough water to meet year-round municipal demands.